Daang matuwid pa ba when big business is practically running the government and profiting immensely at the expense of the people? By July, the 14.2 million consumers of Maynilad Water Services Inc. and Manila Water Co. Inc. will have to shell out more for their water bill. If your household is consuming 30 cubic meters (cu. m.) a month, be ready to pay an additional P234 (if your service provider is Manila Water) to P342 (Maynilad). That’s how huge the looming rate hikes are. Apparently, the 42% annual increase in the profits of Maynilad and 18% for Manila Water in the past five years are not enough for the Big Water monopolies. They want more, at our expense, of course. The increases are due to the so-called “rate rebasing”. It’s a rate adjustment process mandated by the 1997 privatization contract or the Concession Agreement between the MWSS and its private concessionaires – Maynilad and Manila Water. Under the Concession Agreement, the concessionaires are entitled to adjust their basic rates every five years throughout the 40-year contract to achieve a guaranteed rate of return. During the rate rebasing exercise, the concessionaires submit their previous five-year performance, their new five-year business plans and their proposed tariffs to implement it, which the MWSS-Regulatory Office (MWSS-RO) reviews and approves. Since the last rate rebasing exercise in 2007, Maynilad has been posting annual profits of P3.92 billion and Manila Water, P3.68 billion. During the public consultations, Manila Water said they expect to earn P5 billion annually in the next five years after the rate rebasing; Maynilad refused to disclose its anticipated profits. According to regulators, Manila Water wants a rate hike of P5.83 per cu. m. and Maynilad, P8.58 (revised from the P10.30 reported earlier). But these refer to the basic charge only. If you look at your water bill, there are other items in it that will also increase when the basic charge is raised. The environmental charge, for example, is 20% of the basic charge. Then, there’s the foreign currency differential adjustment (FCDA), which accounts for the quarterly fluctuations in the foreign exchange (forex). The FCDA is negative when the peso gains against the dollar and is positive when the peso weakens. The FCDA is currently at negative 0.37% of the basic charge for Manila Water and negative 0.98% for Maynilad. The FCDA is expected to be positive as the dollar is gaining strength in recent months. Then, there’s also the value-added tax (VAT), which is 12% of the basic charge plus the environmental charge. 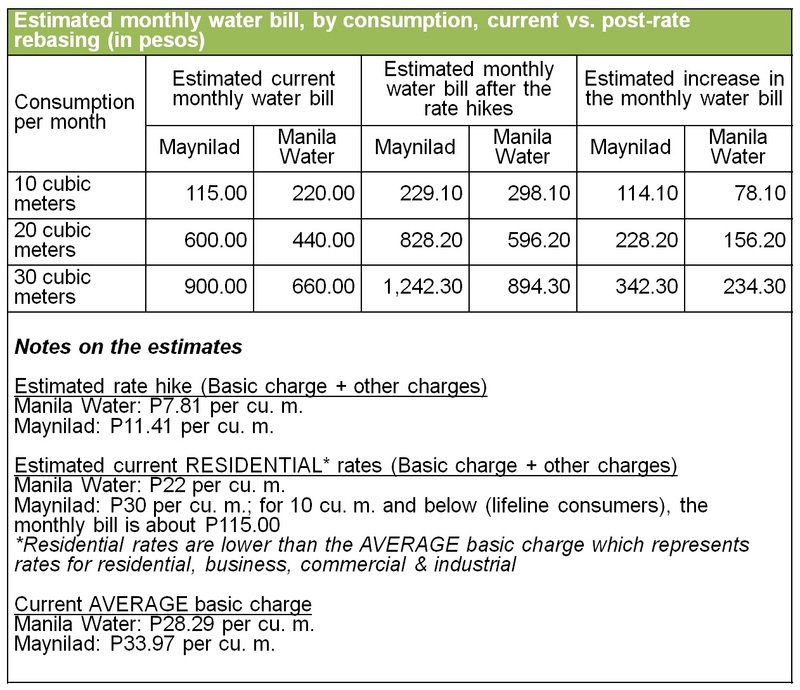 Factoring in these other charges, the rate hike of Manila Water could reach P7.81 per cu. m. and Maynilad, P11.41 per cu. m. Thus, the estimated P234 to P342 increase for households consuming 30 cu. m.
The rate increases being sought by Maynilad and Manila Water are unreasonable for two major reasons. First, the rate hikes cover not just the cost of past projects (which consumers also finance through water tariffs) but also include future expansion and improvement plans. This means that the private concessionaires want to charge consumers the cost of projects that are yet to be implemented. This is clearly anti-consumer and allows the abuses of Maynilad and Manila Water. In their previous rate rebasing exercises, the private concessionaires charged the costs of unimplemented projects to their consumers such as the Laiban Dam Project and the 15 CMS Water Source Replacement Project, among others. According to the MWSS-RO, the costs of unimplemented projects are recovered through succeeding rate rebasing exercises. If that is the case, then water rates should have been reduced during the 2007 rate rebasing. But this did not happen because the cost of new future projects as well as new assumptions in the business plans (population growth, demand, etc.) of the concessionaires negate the supposed cost recovery of unimplemented projects in favor of the consumers. The same scenario is expected in the ongoing rate rebasing exercise. Second, the private concessionaires are earning profits at unreasonably rapid pace. Using the return on rate base (RORB), for instance, it appears that Maynilad and Manila Water are earning beyond the 12% limit imposed on public utilities. Estimates peg the RORB of the concessionaires at more than 14 percent. The rate base is computed by adding up the value of all the assets used in the operation of the public utility and from it, the allowed rate of return is calculated. Thus, the RORB of Maynilad and Manila Water could further go up beyond the estimated 14% if the total value of the old MWSS assets already built prior to privatization is excluded. Meanwhile, using the return on equity (ROE) as standard, it also appears that Maynilad and Manila Water are profiting tremendously from their operations. It is estimated, for instance, that Manila Water has an ROE of around 19% while Maynilad has about 45 percent. These are way higher than the ROE of those in other public utilities such as telecommunications (16%) and electricity (15%). The ROE is a measure of profitability wherein the net income is computed as a proportion of the equity or the investments poured in by the investors. Maynilad and Manila Water has a very high ROE because of the very high tariffs they set while a very large chunk of the cost of MWSS privatization is financed by loans (which are fully passed on to consumers) and not by their actual investments. Alas, despite this really onerous burden awaiting us, we should not expect the Aquino government to step in and restrain the greed of Big Water. Maynilad and Manila Water managed to put their top officials in strategic Cabinet positions, advising the President on key government policies. Secretary Rogelio Singson used to be the president and chief executive officer (CEO) of Maynilad. He now heads the Department of Public Works and Highways (DPWH), where the Metropolitan Waterworks and Sewerage System (MWSS) is an attached agency. Secretary Rene Almendras used to be the president of Manila Water. He is now the so-called “Little President” of the Philippines, after a stint as chief of the Department of Energy (DOE). Almendras is reportedly one of the closest to Aquino, being in the innermost of the inner circle of the President. Singson has the notoriety of generating the first political controversy faced by the Aquino administration. Just a week after taking over as DPWH Secretary, Singson appointed himself as ex-officio chairman of the Board of Trustees of the MWSS. While the move was obviously sanctioned by Malacañang through Executive Secretary Paquito Ochoa, Singson was forced to backtrack after his self-appointment as MWSS head was widely criticized due to conflict of interest. Prior to his appointment as DPWH Secretary, Singson, as Maynilad CEO, tried to seal a midnight deal with Efraim Genuino, Gloria Arroyo’s appointed chairman of the Philippine Amusement and Gaming Corp. (PAGCOR). It involved a water concession deal for the Bagong Nayong Pilipino Entertainment City in Parañaque City that would have reportedly deprived government of an estimated P3.6 billion in water fees. 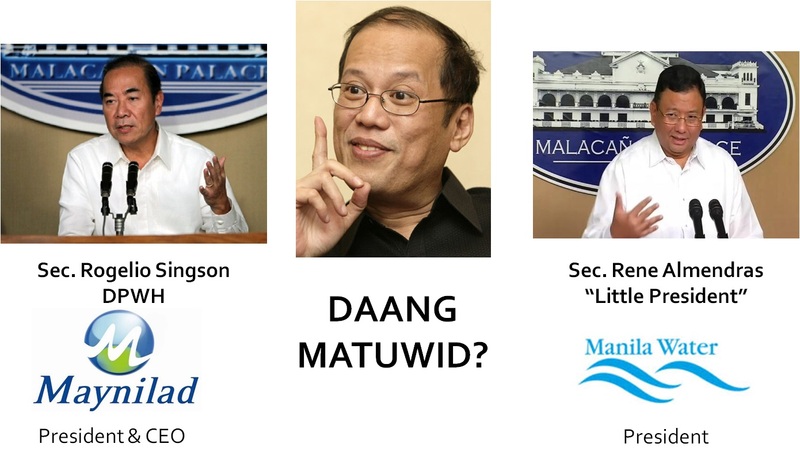 Days before Aquino’s inauguration, Genuino and Singson allegedly teamed up to lobby the MWSS Board to approve the deal because Maynilad was concerned that the new PAGCOR leadership under Aquino might not be as accommodating as Genuino. President Aquino, however, defended Singson, saying that he was satisfied with the Cabinet official’s, as well as PAGCOR’s, explanation that there was no contract yet. Almendras, meanwhile, enjoys a close friendship with Aquino, which dates back to their Ateneo days. His current office, Cabinet Secretary, was created by the President to accommodate Almendras, whom Aquino had to remove from the DOE after a dismal performance underlined by the Mindanao power crisis. The office of the Cabinet Secretary used to be the office of the Cabinet Secretariat which simply facilitates information in Malacañang, according to a Philippine Daily Inquirer report. But Aquino transformed the office through Executive Order (EO) No. 99 and gave Almendras the mandate to among others, determine priorities in the Philippine Development Plan (PDP) and sit in the National Economic and Development Authority (NEDA) board executive committee and subcommittees on infrastructure, social development and investment. NEDA approves public-private partnership (PPP) projects such as MWSS’s Concession Agreements with Manila Water and Maynilad. Changes in the contract between the MWSS and the private concessionaires, including those that concern water rates, also require NEDA sanction. Aquino indeed has deep ties with the Big Water monopolies. The Ayala family, which controls Manila Water, has a long history of close association with the Aquino family, dating back to the time of Aquino’s late mother Cory as Philippine President. Manny V. Pangilinan, who controls Maynilad, has done a number of mega business deals with presidential cousin and officially declared top Aquino funder in the 2010 polls, Tonyboy Cojuangco such as the PLDT and TV5 deals. MVP and the Ayalas are seen as among the major backers of Aquino in his presidential bid. So don’t be surprised that the chief executives of their business interests landed strategic Cabinet positions. Don’t be surprised as well that Aquino made PPP or privatization his centerpiece economic program. PPP creates more opportunities for MVP and the Ayalas to further expand their business empires. In fact, Pangilinan’s group and the Ayala family are among the most aggressive in cornering PPP contracts being offered by administration. The Ayalas, for instance, clinched the very first PPP project of Aquino – the P1.96-billion Daang Hari-SLEX Link Road Project. Meanwhile, MVP and the Ayalas have teamed up to bid for the P60-billion extension and privatization of LRT 1, the largest PPP project of the Aquino administration. Incidentally, Malacañang is even using the privatization of MWSS as a showcase in promoting PPP. MWSS privatization is truly a showcase of how PPP can be so profitable for big business. But it’s also a showcase of how privatization can be so oppressive and onerous. MVP’s Metro Pacific Investments Corp. (MPIC) holds 43% of Maynilad. The Consunji family, which also has close ties with Aquino, controls 25% through DMCI Holdings. Big foreign companies have a substantial share in Maynilad as well with MCNK JV Corp., a unit of Japanese giant Marubeni Corp., and Lyonnaise Asia Water Limited, a unit of French firm Suez, one of the world’s largest water companies, each holding a 16% stake. The Ayala Corporation, on the other hand, has a direct 43%-stake aside from the share being held by Philwater Holdings Co. Inc., which is 60% owned by Ayala and 40% by UK-based United Utilities. Other investors in Manila Water include another Japanese giant, Mitsubishi Corp. (8%) and the World Bank’s IFC (6%) as well as First State Investments of the UK (10%), Singapore-based global fund manager Aberdeen Asset Management plc (5%) and US-based equity mutual fund Smallcap World Fund Inc. (5%). Daang matuwid pa ba when big business is practically running the government and profiting immensely at the expense of the people? Water rates today are about 585% to 1,119% higher than the initial rates when MWSS was privatized. Our water bill is now among the most expensive in Asia. Still, we face more increases that the Aquino administration will allow despite the harsh impact on the people and despite rising poverty and joblessness. Cherry picked using only ideas that will toss up the writers preconceive opinion on the matter. Definitely not a balanced view of things. This is a tainted discourse populated by bits of facts and a ton of emotional conspiracies that often is so far fetch and over reaching that it boggles the mind. Lousily researched and definitely not for public consumption.